Jiva Goswami was broken hearted by this order of his Guru, he left and went to the Yamuna, there he wanted to leave his body. He was living under the trees and fasting, and anyhow he fainted and a devotee of Mahaprabhu called Gopal, who was also a friend of Jiva Goswami came by Jiva in this lamentable situation. This Gopal had some sakhya bhava and some parakiya bhava, that is paramour love and conjugal love. That is he had some attachment for conjugal life, that is vedic rules married life, like the relationship of a husband. He liked that more than the paramour mood, anyhow he was a friend of Jiva Goswami and Jiva had promised him that he would show that Radha and Krsna are eternal conjugal lovers. Although Jiva was leaving his body, he remembered his promise to his friend Gopal and in seven days he composed the great book "Gopal Champu". Sanatana Goswami was unhappy to hear about Jiva Goswami heavy chastisement by Sri Rupa and he went to see Rupa. Then Sanatana asked Rupa could he tell him in a short way the gist of the teachings of Mahaprabhu. Sri Rupa replied "jiveraya name ruci, vaisnava sevaya" and "nirantai kara Krsna nam sankirtan" these are the teachings of Mahaprabhu, in this way. "jive raya" means mercyfull to the conditioned souls, and nama ruci and vaisnava seva, means chant Hare Krsna and do vaisnava seva, this is the gist of Mahaprabhus teachings. The word "jiveraya" means conditioned souls and also means Jiva Goswami. Then Sanatana Goswami replied, but I have seen that Jiva, he is dying on the bank of the Yamuna under a tree. This is not good, he is a young boy and he was only fighting for the honour of his Guru, and I think that is alright, why are you so strict with Jiva. Then he left. So Rupa Goswami was feeling that Sri Sanatana was his guru and thinking that it was the desire of Sanatana that he bring back Jiva Goswami. Rupa Goswami then went to the bank of the Yamuna to find Jiva, upon seeing his gurudev Jiva began to cry and Rupa Goswami embraced him and took him back and they stayed happily together. When anyone ever tried to teach Rupa Goswami something Jiva Goswami could not tolerate it and many times he could not control himself in this regard. Sri Jiva Prabhu saw Rupa Goswami as the topmost authority regarding the teachings of Mahaprabhu, so Jiva could not tolearte it if someone tried to teach something to his gurudev. One day Jiva Goswami challenged Gopal Bhatta Goswami, this is what happened. Rupa Goswami used Gopal Bhatta Goswamis name in the book Hari Bhakti Vilasa, with the full consent of Gopal Bhatta. And Jiva Goswami composed the "Satsandarva" from the compositions of Gopal Bhatta Goswami. But one day while Rupa Goswami composed some slokas, Gopal Bhatta listened happily, and commented that there was a little sansrit fault in such a place and you may correct it like this. Rupa Goswami was very humble and immediately he corrected that. Jiva Goswami was also there but at some distance, and he left the bhajan kutir. Then Gopal Bhatta Prabhu left and Jiva Goswami showed the waterpot to Sri Rupa indicating that he was going to the Yamuna for some water, but he was not. Actually he ran after Gopal Bhatta Goswami, he wanted to ask Gopal Bhatta what he said about the poetry of Rupa, was it correct or not. Gopal Bhatta asked Jiva his name and what was his interest in the poetry of Rupa Goswami. Then Jiva Goswami replied that he was the servant of Rupa Goswami. Jiva then said to Gopal Bhatta "you see, what Rupa has written is correct, if you look at it this way" and then understanding, Gopal Bhatta Boswami was very happy hearing the explanation of Sri Jiva. Bopal Bhatta Goswami went back to Rupa Goswami and told him that what you have first written you can keep that word like that, it is allright, I was wrong. Your composition is perfect. Sri Rupa replied "alright, if it is your desire I shall keep it like that." When later Gopal Bhatta Goswami said to Rupa Goswami, I have seen a young boy near to your bhajan, he met with me and we discussed this particular composition and I think that he is a great pandig. Who is he, he is very intelligent and he has corrected me, tell me about that boy." Then Rupa explained that Jiva is his nephew and that he is trying to serve here, but this is not good that he has tried to correct your grammar. But Gopal Bhatta replied "what that boy told is correct, he is right, my conception was wrong. So as you have first written that is correct, please keep it that way." Then Gopal Bhatta Goswami left and Jiva Goswami came in with the water and Rupa said to him, "Oh, why are you doing this again and again, it is not good actually. You are living in Vrndavana Dham so you must always be humble. Jiva Goswami replied "Yes, Guru Maharaj, it is true, but what will be right if anyone will say it is wrong, therefore it was necessary to show him that what you had composed was perfect, that is all I said to that vaishnava." But Rupa Goswami said "It may be right or wrong, that doesn't matter, it was the desire of the vaisnava that I change that word then I shall change that word." Sri Rupa gave some explanations showing that he was not happy with Jiva for doing this time and time again. But in his heart Rupa had much affection for Jiva and he knew that in the future he would (jiva), do much service for the sampradaya, because he knew expert sanskrit and his conception of the philosophy of Mahaprabhu was very clear. Now we can see all the wonderful books composed by Jiva Goswami, and his "Satsandarbha" is the highest philosophical book in our sampradaya. In this way Rupa Goswami and Sanatana Goswami and Jiva Goswami were living in Vrndavana along with the many other devotees of Mahaprabhu. A friend of Mahaprabhus called Jagadananda wanted to go to Vrndavana and Mahaprabhu told him that they were his guardians and that he need not go anywhere else, but "because you are my friend Jagadananda Prabhu, they will consider you higher than themselves, but please, you don't think like that. They are actually living in a higher position then you, you please stay with them and follow their instructions, and don't go to see the Gopal on the hill of Govardhan, because that is Krsna Himself, so don't put your feet on the hill of Goverdhan." That was His advice to His dear friend Jagadananda Pandit. Later when they finished their seva in Vrndavana they took samadhi. Rupa Goswami took samadhi in Radha Damodar and Sanatana Goswamis samadhi is near to Madan Manohar, and Jiva Goswami and others joined in the mission of Mahaprabhu in Vrndavana and there were many devotees at that time. The Goswamis of Vrndavana all had long lives even though they only rested a little every night and they also ate very little and they were all over eighty. We are taking medicine and they did not, their bodies were also very strong, they did not have many garments and they did not have shoes, we cannot imitate them. Raghunath Das Goswami would only take one pot of Buttermilk a day (250 gram) and Rupa and Sanatana would sometimes cook some chapatis and they would keep them up to seven days and with a little rich and spinach that was offered to them, they would offer that to Madan Mohan and take that prasadam. When I went to Vrndavana with Srila Guru Maharaj in 1947, I stayed with Guru Maharaj in the Bhajan kutir of Sanatana Goswami. There are two caves, and in one cave Krsna Das Babaji was living and the other cave was vacant. Guru Maharaj stayed in that cave and inside there were two or three rooms and other babajis also lived there, one whose name was Dinatihar Prabhu and the other was a babaji disciple of Srila Saraswati Thakur and there were one or two others. Anyhow they have shown me how they did their "madhava kuri" and also how to perserve the roti. One day they will do "madhava kuri" that is they go from door to door and the people of Vrndavana will give them some rotis, and they will collect 15 or more rotis. Then they will eat two rotis in the morning and two in the evening and the other rotis they keep in the open almira, cabinet. Because the climate is so dry in Vrndavana the rotis also dry out and after fifteen days to one month they become like hard biscuits. Then they wash the roti with water and put into the buttermilk in the morning (2 rotis) then they will take that at noon time and the roti will be soft. Then again two rotis in the evening and in the morning they will take some boiled wheat with some buttermilk and that is their breakfast. We also took like that but they arranged roti and dal for Srila Guru Maharaj, I would collect that roti and dal from the "chatra" the free distribution center and I would collect that at noon time. Srila Guru Maharaj and Krsna Das Babaji Maharaj arranged some festivals there at the bhajan kutir of Sanatana Goswami. Jiva Goswami tenía el corazón roto, debido a la orden de su gurú, él salió y se dirigió al Yamuna, pues quería dejar su cuerpo. Estaba viviendo y ayunando bajo los árboles y se desmayó y un devoto de Mahaprabhu llamado Gopal, quien también era amigo de Jiva Goswami, lo vió a Jiva en esta lamentable situación. Este Gopal tenía algunos bhava sakhya y algunos bhava parakiya, que es la cualidad de amor de amante y la cualidad de amor conyugal. Eso es, él tenía algunas cualidades para la vida conyugal, que son las normas Védicas, para la vida de casado, como la relación de un marido. Le gustaba más que el estado de ánimo del amante, de todos modos era un amigo de Jiva Goswami y Jiva le había prometido que le mostraría que Radha y Krishna son eternos amantes conyugales. Aunque Jiva estaba dejando su cuerpo, recordó su promesa a su amigo Gopal y en siete días compuso La Gran Obra de "Gopal Champu". Sanatana Goswami estaba triste por el pesado castigo a Jiva Goswami por Sri Rupa y fue a ver a Rupa. Sanatana le preguntó: "Rupa, podría decirme de forma breve la esencia de las enseñanzas de Mahaprabhu. Sri Rupa respondió "jiveraya name ruci, vaisnava sevaya" y "nirantai kara Krsna nam sankirtan", estas son las enseñanzas de Mahaprabhu, de esta manera. Misericordia a las almas condicionadas, significa "jive raya" y nama ruci y vaisnava seva, significa cante Hare Krishna y haga seva vaisnava, esto es la esencia de las enseñanzas de Mahaprabhu. La palabra "jiveraya" significa las almas condicionadas y también Jiva Goswami. Entonces respondió Sanatana Goswami, pero he visto que Jiva, se está muriendo en la orilla del Yamuna debajo de un árbol. Esto no es bueno, es un chico joven y él sólo estaba luchando por el honor de su gurú, y creo que está bien, por qué es tan estricto con Jiva. Luego se fue. Así que Rupa Goswami sentía que Sri Sanatana era su gurú y pensando que era el deseo de Sanatana que él trae Jiva Goswami. Rupa Goswami luego fue a la orilla del Yamuna encontrar Jiva, al ver su gurudev que Jiva comenzó a llorar y Rupa Goswami lo abrazaron y lo recuperó y se quedaron felices. Cuando alguien intentaba enseñar algo que no podría tolerar Jiva Goswami Rupa Goswami y muchas veces él no podían controlar él mismo en este sentido. Sri Jiva Prabhu vio Rupa Goswami como la autoridad superior con respecto a las enseñanzas de Mahaprabhu, Jiva podría no tolearte si alguien trató de enseñar algo a su gurudev. Un día que Jiva Goswami desafió Gopal Bhatta Goswami, esto es lo que pasó. Rupa Goswami utilizó Gopal Bhatta Goswamis nombre en el libro Hari Bhakti Vilasa, con el pleno consentimiento de Gopal Bhatta. Y Jiva Goswami compuso el "Satsandarva" de las composiciones de Gopal Bhatta Goswami. Pero un día mientras Rupa Goswami compuso algunas slokas, Gopal Bhatta había escuchado felizmente y comentó que había una pequeña falta de sansrit en un lugar y lo puede corregir esto. Rupa Goswami era muy humilde e inmediatamente corrigió eso. Jiva Goswami también estaba allí pero a cierta distancia, y dejó el bhajan kutir. Luego fue Gopal Bhatta Prabhu y Jiva Goswami demostró el cántaro a Sri Rupa indicando que iba al Yamuna para un poco de agua, pero no estaba. En realidad corrió tras Gopal Bhatta Goswami, quería preguntarle Gopal Bhatta lo que dijo sobre la poesía de Rupa, fue correcta o no. Gopal Bhatta pidió Jiva su nombre y cuál fue su interés en la poesía de Rupa Goswami. Entonces Jiva Goswami respondió que él era el siervo de Rupa Goswami. Jiva dijo a Gopal Bhatta "ya ves, lo que ha escrito Rupa es correcto, si lo miras así" y luego comprender, Gopal Bhatta Boswami estaba muy feliz de escuchar la explicación de Sri Jiva. Bopal Bhatta Goswami volvió a Rupa Goswami y le dijo que lo que primero ha escrito que puedes quedarte con esa palabra, es muy bien, me equivoqué. Su composición es perfecta. Sri Rupa respondió: "Bueno, si es su deseo me quedaré lo así." Cuando más tarde Gopal Bhatta Goswami dice que Rupa Goswami, he visto a un niño cerca de tu bhajan, se reunió conmigo y hablamos de esta composición particular y creo que es un gran pandig. ¿Quién es él, es muy inteligente y él me ha corregido, háblame de ese niño. " Rupa explicó luego que Jiva es su sobrino y que está tratando de servir aquí, pero esto no es bueno que intentó corregir su gramática. Pero Gopal Bhatta respondió: "lo que dijo ese chico es correcto, que tiene razón, mi idea era equivocada. Así como usted ha escrito primero es correcto, por favor siga así." A continuación, Gopal Bhatta Goswami izquierda y Jiva Goswami vino con el agua y Rupa le dijo, "Oh, ¿por qué haces esto otra vez y otra vez, en realidad no es bueno. Están viviendo en Vrndavana Dham así que siempre debes ser humilde. Jiva Goswami respondió: "Sí, Guru Maharaj, es cierto, pero lo que será adecuado si alguien dirá que está mal, por lo tanto era necesario demostrarle que lo que había compuesto era perfecto, eso es todo que le dije a esa vaishnava." Pero Rupa Goswami dijo "puede ser bien o mal, eso no importa, era el deseo de los vaisnava que cambiar esa palabra entonces cambiaré esa palabra". Sri Rupa dio algunas explicaciones demostrando que no estaba contento con Jiva por hacer esto y otra vez. Pero en su corazón Rupa tenía mucho afecto por Jiva y él sabía que en el futuro lo haría (jiva), mucho servicio para el sampradaya, porque él sabía sánscrito experto y su concepción de la filosofía de Mahaprabhu era muy clara. Ahora podemos ver todos los libros maravillosos compuestos por Jiva Goswami, y su "Satsandarbha" es el libro filosófico más alto de nuestra sampradaya. De esta manera Rupa Goswami y Sanatana Goswami y Jiva Goswami vivían en Vrndavana junto con muchos otros devotos de Mahaprabhu. Un amigo de Mahaprabhus llamado Jagadananda quería ir a Vrndavana y Mahaprabhu le dijo que eran sus guardianes y que él no necesita ir en cualquier otro lugar, pero "porque eres mi amigo Jagadananda Prabhu, le considerará mayor que ellos mismos, pero por favor, no piensas así. Son en realidad viviente en una posición más alta, entonces usted, por favor quédate con ellos y seguir sus instrucciones y no ir a ver el Gopal en la colina de Govardhan, porque eso es Krsna mismo, para que no ponga los pies en la colina de Goverdhan." Ese fue su Consejo a su querido amigo Jagadananda Pandit. Más tarde cuando terminaron su seva en Vrndavana llevaron samadhi. Rupa Goswami tomó samadhi en Radha Damodar Sanatana Goswamis samadhi está cerca de Madan Manohar, Jiva Goswami y otros se unieron a la misión de Mahaprabhu en Vrndavana y hubo muchos devotos en aquel momento. Todos los Goswamis de Vrndavana tenía largas vidas aunque sólo descansaron un poco cada noche y también comían muy poco y quitaba de ochenta años. Estamos tomando medicina y no lo hicieron, sus cuerpos también fueron muy fuertes, que no tenían muchas prendas de vestir y no tenían zapatos, nosotros no podemos imitarlos. Raghunath Das Goswami sólo necesitaría un pote de leche al día (250 gramos) y Rupa y Sanatana a veces cocinaba unos chapatis y les mantendrían siete días y con un poco de ricos y espinacas que fue ofrecido a ellos, se ofrecer Madan Mohan y tomar ese prasadam. Cuando fui a Vrndavana con Srila Guru Maharaj en 1947, me quedé con Guru Maharaj en el Bhajan kutir de Sanatana Goswami. Hay dos cuevas y en una cueva vivía Krishna Das Babaji y la otra cueva estaba vacante. Guru Maharaj se quedó en esa cueva y dentro había dos o tres habitaciones y otros babajis también vivía allí, uno cuyo nombre era Dinatihar Prabhu y el otro era un discípulo de babaji de Srila Saraswati Thakur y hubo uno o dos más. De todos modos me han demostrado cómo hicieron su "madhava kuri" y también cómo preservara el roti. Un día harán "madhava kuri" que es van de puerta en puerta y la gente de Vrndavana les dará algunos rotis, y recogerá rotis 15 o más. Entonces comen dos rotis en la mañana y dos en la tarde y el otro rotis mantienen en el abierto almira, gabinete. El clima es muy seco en Vrndavana las rotis también seco y después de quince días a un mes se convierten como galletas duras. Luego lave con agua el roti y poner en el suero de leche en la mañana (2 rotis) luego llevarán al mediodía y el roti será suave. Entonces otra vez dos rotis en la noche a la mañana se llevarán algunos trigo hervido con un suero de la leche y que es su desayuno. También tomamos así pero arreglaron roti y dal de Srila Guru Maharaj, recaudaría el roti y dal de la "chatra" el centro de distribución gratuita y recojo en el mediodía. Organizar algunas fiestas allí en el bhajan kutir de Sanatana Goswami Srila Guru Maharaj y Krishna Das Babaji Maharaj. Sri Jiva fue uno de los seis goswamis de Vrindavana. Fue hijo de Sri Vallabha (más comúnmente llamado Anupama, que fue el nombre que le dio Sri Caitanya) y sobrino de Sri Sanatana y Sri Rupa, quienes eran tres hermanos empleados al servicio de Badsa Hussain Shah. Sri Jiva fue su único descendiente. Siendo sus parientes grandemente recompensados por el Badsa, su hogar era muy opulento. Nada faltaba para el niño. Su complexión era dorada, sus ojos como pétalos de loto, cada parte de su cuerpo tenía un radiante esplendor. Cuando el Señor Caitanya visitó Ramakeli, en el norte de Bengala Occidental, Jiva, quien era sólo un niño, secretamente tuvo un darsana con el Señor. Este darsana tuvo tal impacto, que Jiva inmediatamente dejó de jugar como un niño y desarrollo amor por el Señor. En Vrindavana, viendo que Jiva se había vuelto muy experto en la conclusión del Srimad Bhagavatam, Sri Rupa lo encargó de corregir las pruebas de su Bhakti-rasamrta-sindhu. Jiva compiló también un comentario sobre el Bhakti-rasamrta-sindhu llamado Durgama sangamani. Sri Sanatana Gosvami compiló el Sri Vaisnava tosani, un comentario sobre el décimo canto del Srimad-Bhagavatam, y encargó también a Sri Jiva para corregir las pruebas. Bajo la orden de Sri Sanatana, Sri Jiva compiló un comentario sobre dicha obra llamada Laghu Vaisnava tosaniin. Sus escritos cautivaron completamente a los eruditos de su época. Fue el inicio de una era dorada en Sri Vraja dhama. Sri Jiva traía regularmente agua para que Sri Rupa y Sanatana tomasen su baño. Masajeaba sus cabezas con aceite, limpiaba su ashrama, adoraba a la Deidad, cocinaba y corregía los manuscritos. Jiva recibió iniciación diksa de Rupa Gosvami. Mientras Rupa Gosvami escribía el manuscrito de su Bhaktirasamrtasindhu, Vallabha Bhatta llegó allí, tomó las hojas de Sri Rupa, los revisó, y antes de irse señaló los errores en un sloka (verso). Jiva Goswami no podía tolerar un insulto su guru, Rupa. No obstante, en vez de tratar el asunto delante de su guru, Jiva tranquilamente dejó el lugar con el pretexto de traer agua y abordó a Vallabha en el camino. Un largo argumento tuvo lugar y finalmente Vallabha admitió su derrota. Al día siguiente, Vallabha fue donde Sri Rupa y alabó el talento de Jiva. Pero Rupa no apreció la acción de su sobrino y lo castigó diciendo que era aún incapaz de controlar su mente y por tanto debía abandonar el lugar y retornar sólo después de lograr hacerlo. Siguiendo la orden de su guru, Jiva fue a las afueras de Vrindavana y, con la intención de abandonar su vida, se echó en el suelo rehusándose a bañarse o tomar alimentos. No obstante, Sanatana regresó, y le pidió a Sri Rupa que perdone a Jiva, y así él volvió al hogar. Bajo similares circunstancias Jiva derrotó a otro digvijaya pandita con argumentos de las escrituras que continuaron por siete días. Srila Rupa Gosvami appeared in 1489 in Karnataka, South India. He was the younger brother of Srila Sanatana Gosvami. Forced by various circumstances, Srila Rupa Gosvami and Sanatana Gosvami had to work for the Muslim government of Bengal under Nawab Hussein Shah. Rupa Gosvami was then known by the Muslim name Dabir Khas ("private secretary"). Although he enjoyed great wealth and prestige, he never forgot Lord Sri Krsna. 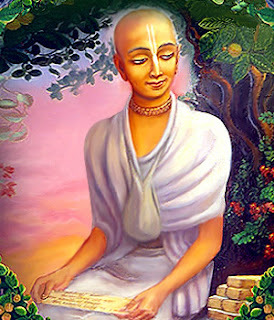 Even before meeting Sri Caitanya Mahaprabhu, Rupa Gosvami had already written several books on Vedic philosophy and was renowned for his learning and devotion. In 1514, Rupa and Sanatana met Sri Caitanya Mahaprabhu for the first time and were initiated by Him. Rupa left government service and spent ten days hearing from Sri Caitanya Mahaprabhu the philosophy of Krsna consciousness. Sri Caitanya then ordered Rupa Gosvami to go Vrndavana with a fourfold mission: (1) to uncover the lost sites of Lord Krsna's pastimes, (2) to install Deities of the Lord and arrange for Their worship, (3) to write books on Krsna consciousness, and (4) to teach the rules of devotional life. At first Rupa Gosvami felt great difficulty carrying out the desire of Lord Caitanya. But one day, while Rupa was sitting on the bank of the Yamuna River contemplating his mission, a beautiful boy came to him and asked the cause of his despondency. Rupa Gosvami explained. The boy then led him to a small hill. "Inside this hill," said the boy, "is the beautiful Deity Govindadeva." He said that the Deity had been buried to protect Him during a Muslim invasion. The next day Rupa Gosvami led a group of villagers to the site and had them excavate the hill. The Deity Govinda was unearthed. Rupa Gosvami then had a magnificent temple constructed under the patronage of Emperor Akbar and Maharaja Man Singh of Amber, Rajasthan. Rupa Gosvami fulfilled all four parts of the mission given to him by Lord Caitanya, including writing many books on Krsna consciousness. He passed away in 1564. Devotees pay respects to him by visiting his samadhi, or memorial tomb, in the courtyard of the Radha-Damodara temple in Vrndavana. Rupa Goswami vivió de 1489 a 1564. 1- Descubrir los lugares perdidos en que Sri Krishna realizo sus pasatiempos. 2- Instalar Deidades y empezar la puja. 4- Propagar las reglas del bhakti-yoga. Usando sólo kaupina o taparrabos, y kantha o retazos de colcha, Sri Rupa Gosvami vivió una vida mendicante, absorto en escuchar, cantar, y escribir sobre los dulces pasatiempos amorosos de Radha-Govinda en Sri Vrindavana-dhama. Sri Rupa Gosvami escribió libros profundamente trascendentales. Él estableció Sri-Sri Radha-Govindaji, las amadas Deidades de toda la Gaudiya sampradaya. Sri Krishna Dasa Kaviraja dice que la Deidad de Radha-Govindaji nos muestra cómo adorar a Radha y Krishna. A través de una amplia investigación Védica Sri Rupa Gosvami demostró que las enseñanzas de Sri Chaitanya presentan la más alta filosofía y perfección de la religión. Los Gaudiya Vaishnavas se conocen como rupanugas, los seguidores de Sri Rupa Gosvami. Cada devoto rupanuga aspira a convertirse en un sirviente del sirviente de los pies de loto de Sri Rupa Gosvami. Narottama Dasa Thakura dice que para entender los asuntos amorosos de Radha y Krishna, se debe servir a los pies de loto de Sri Rupa Gosvami con intenso afán. Servicio también quiere decir rezar gritando, meditando sobre, y dedicando su vida entera a los pies de loto de Sri Rupa Gosvami (Sri Rupa-manjari). Sadhana Dipika declara que aquellos que están en el camino de servicio piadoso siempre deben asociarse con las doctrinas Sri Rupa Gosvami sobre prema-bhakti. Por la gracia de Sri Jiva Gosvami uno puede entender las verdades transcendentales de las enseñanzas de Rupa Gosvami. Cuando Sri Rupa Gosvami se sentó en su bhajana kutir en Ter Kadamba en Nandagram, Vrindavana, y escribió sobre el dolor de la separación que Sri Sri Radha y Krishna sentían uno del otro, las hojas del árbol Kadamba se caían, al igual que las lágrimas corriendo por la cara de alguien con dolor. Y cuando Sri Rupa escribió acerca de la extática y amorosa reunión de Radha y Krishna, del árbol Kadamba inmediatamente brotaban nuevas hojas y florecían flores. 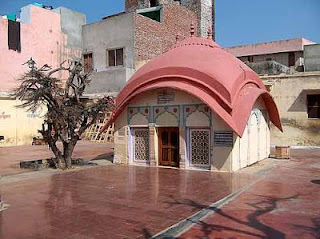 El samadhi de Sri Rupa Gosvami y el bhajana kutir están en Seva Kunja en el patio del templo Radha-Damodara. El samadhi de Rupa Gosvami está al frente. VRINDA calendario: Junary 14, 2013. Srila Jiva Gosvami disappearance. Sri Jiva Goswami - Disappearance | Krishna. Su Power Mantra Personal - Meditación Activa! Seven Vrindavana Temples | www.